Thank you for your interest in my tutorial. The tutorial has moved and is available in its entirety at this link. Best wishes, Bloom. Thanks for the tip! Love how this works-definitely will be using it! Thanks Bloom for the great tip;) I'm going to try it! Okay, great information and a big tease on your project. Now I know that I am going to NEED some Etchings. Great Trick - Thanks for sharing! Wonderful tip. Thanks!! 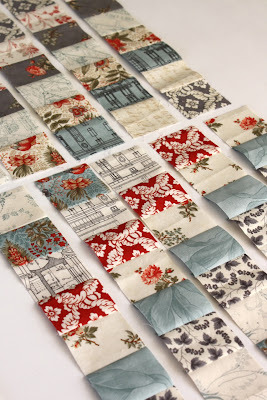 I love your fabrics in this project. Awesome! That is the tip I needed this time last year when I made a quilt for granddaughter to take to Uni, if you are interested go back to Jan this year. Thanks I will give this a go for another project I have in mind. great tip...thank you for sharing. Looks lovely. Those fabrics are just beautiful. Great technique. What a lovely wall hanging. This is a great technique. I used it to make a tiny checkerboard pattern. Great idea Ros. Love the fabrics. 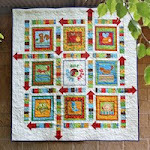 This is how Eleanor Burns does the Trip Around the world quilt. That's where I first saw it. Its a great method. Was just thinking the same thing! That's also the technique used for Bargello designs. Thanks for sharing this technique. 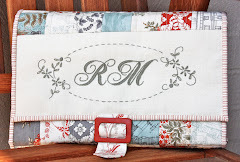 I have been looking for something to use for a quick table runner for in between the holidays. Thanks again! Soooo I just came across this tip and it was in 2011. I am retired, learning new things and loved how this was put together!. Since I am a new learner it took me awhile to figure it out in my head. I am a visual learner so I am so glad for your pics. Can you tell me if you ever shared your secret project with this web site? Well yes, I published my 'secret' project is in this post: http://bloomandblossom.blogspot.com.au/2012/04/coquetterie.html. And here: http://bloomandblossom.blogspot.com.au/2013/03/coquetterie-cosmetic-wallet-pdf-pattern.html. It remains one of my all-time favourite projects! I wish I would have seen this tip before Friday. :( I have been sewing strips of 21/2 in squares together and it seems to be upsetting my brand new machine. It has auto tension and going over all those seems is making it mess up. Great tip will surely put it to good use thanks! thanks for sharing your tip. love those short cuts! Thank you for the tip. I am a novice in quilting and this makes perfectly good sense! 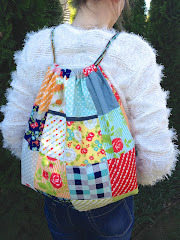 Loved it, tried it with strips I'd sewn a year ago. Made the fabrics come alive, so I owe you, big time! Thanks for sharing. Thank you so much for this fabulous tip.